You would think that, with all the advances in technology, insights and automation, Marketing has leapt forward with an increased understanding of how initiatives correlate to business performance. We’ve made developments in digital to improve targeting, to scale relevant audiences and to develop customized communications based on enhanced insights. Yet, marketers continue to face pressure to demonstrate Return On Investment. 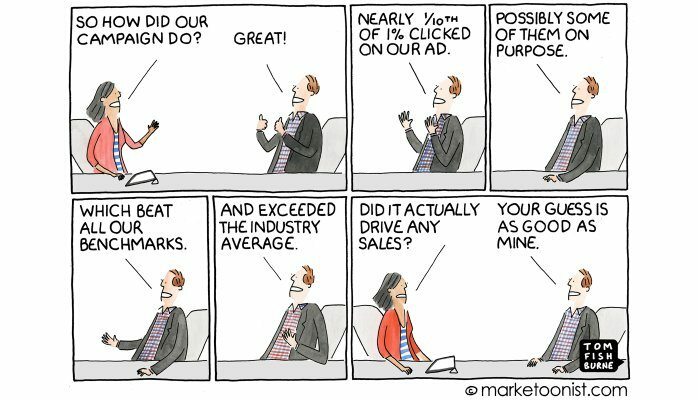 This is the year when the industry garners increased clarity on program metrics and attribution. Click fraud has become much more pervasive and as of 2016 was at an all-time-high. The more advertisers spend on online ads, the higher the occurrence of click fraud. In 2016 for every online media dollar spent, $0.44 was attributed to ad fraud or $31 billion. This alone is mandating ad networks like Google to create defences against invalid clicks (either illegitimate or unintentional). Inflated metrics: Facebook, itself, has been under scrutiny in the latter half of 2016 for inflating video viewability reports, with prominent third party audits confirming these numbers were inflated by between 60-80%. More recently, Facebook announced it was miscounting shares and likes and sought to update its calculation for audience reach. Despite these hurdles, it’s estimated that digital ad spend will continue to climb to an estimated $75.6 billion in the US this year (an 11% increase from 2016). The winners will include spend in all formats for mobile search; programmatic, video and social ad spend. But this comes with increased expectations. It will put increasing pressure on both media agencies and ad networks to mitigate negative impacts and improve legitimate ad performance. No longer can we place strong confidence in traditional KPIs like impressions or clicks especially when they aren’t translating into business results. We need to go back to basics. For the advertiser, this means an increased responsibility to reconcile ad spend with owned assets. Despite what networks report, marketers will need to cover their basis: 1) URL tagging to properly report click behavior. 2) Google Analytics will to validate traffic volumes and sources. … as much as possible, focus as far down funnel in your marketing operations as you can… Look inside your CRM. How many customers had Facebook, Twitter, or LinkedIn somewhere in their attribution history? How many customers interact with you on social media now? Focus your social media marketing and measurement efforts on the most valuable members of your audience, either to convert them or retain them. If Digital continues to be the channel to acquire and retain, then marketers need to become more focused on the things over which they have control – what they KNOW about customers and performance. Marketers will question everything. More importantly, they will begin to seek out answers to questions that impact business performance overall. The lines drawn among sales, marketing and customer service become increasingly blurred because the activities from one function will inevitably impact the other. This means the business has to have a holistic view of these initiatives by aggregating the data from multiple programs, and appropriately attributing conversions or losses by the right channel. Move away from Conversion as the ONLY hero metric. Business needs to also understand how Net Promoter Score and Engagement will impact business loss and wins. These have not traditionally been brought to light as strong metrics because each function has been siloed. Insist on understanding the business impact from online media initiatives. It means not relenting to traditional KPIs like impressions, clicks and cookies to infer results. This means correlating views to website visits, and pageviews but going a step further by analyzing the users. Be relentless at determining if leads are indeed the relevant audience you were targeting. Do this earlier in the acquisition process. Become customer obsessed. All road will converge here. It also becomes a starting point and a point of validation in truly understanding customer. Understanding what behaviors lead to conversion, what traits are displayed by your most profitable customers, what channels they came from. More, importantly, understand what your customers care about the minute they leave your site or walk out your bricks and mortars door. This will need to be stitched together to garner a higher-order of understanding customer. This will lead to process that will impact ad targeting, personalized messaging and optimized performance with the intention to continuously learn about the triggers that lead to a positive outcome, and naturally, to determine how to gain and keep your customer’s attention. That is the panacea… We have yet to get there. 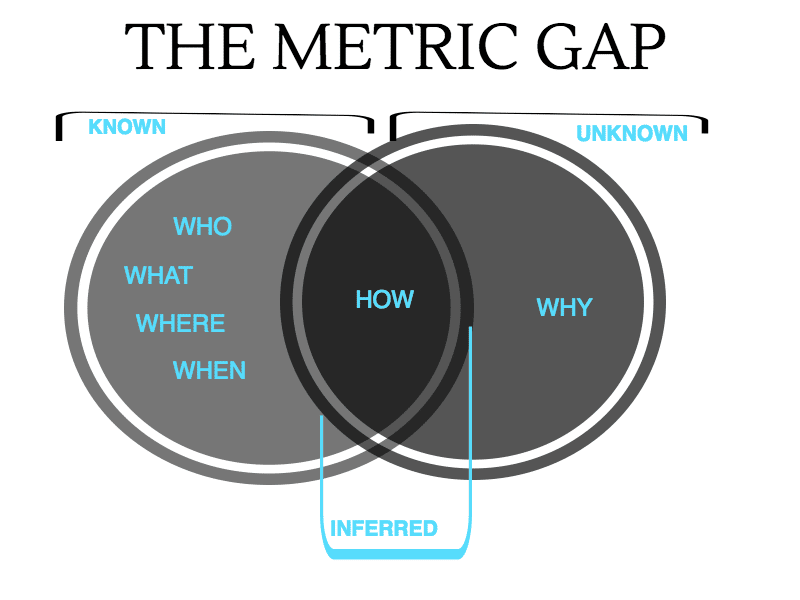 What exists today is a metric gap that only tells a partial story. What is known are the standard KPI’s that everyone has bought into: the impressions, the audience follower and affinity values, and the click behaviour. The inferred metrics give us a glimpse into potential customer intent. These come from cobbling together known metrics with owned assets like landing page information, Omniture, Google Analytics etc. However, what is unknown is validation of intent or meaningful data to corroborate the known and inferred. User data on social networks, search and websites will provide companies increasing context into their lives, their needs and will give business access to real-time understanding of what behaviors may drive appropriate business action. More importantly, focus on what is already known about your customer: While their needs and social context will enhance understanding, leverage their current “business-impact” to properly segment them based on value, interest propensity, purchase history and business viability. What’s important is the ability for technology to leverage machine learning to understand the patterns in behaviour, purchase, interest etc that profile and segment customers and create unique clusters that are much more holistic and less transactional in nature. Perpetual profiling allows these profiles to change, and segments redefined based on continuous ingestion of attributes. The path to scaling personalization is HERE. It’s dynamic and it allows business more precise information that improves the ability to target, provide relevant communications and garner more effective results in the process. Qualified leads: Use behavioral and social data to verify prospect leads and identify false positives. Enrich customer profiles: leverage behavioral and profiling information to enhance knowledge about your customers. This includes: what’s important to them, what topics they consume, share, what/who influences their opinion and behavior. Today’s segments allow for dynamic profiles that will call for agile communication strategies that are in step with the customer’s daily life. Machine learning will also enable scoring systems to develop best-fit models that define audience segments, product matches, affinities and customer value. Developing an end-to-end accountable framework: Acquisition to retention will require continuous optimizations based on updated market and customer data to improve performance. Marketers now will have more understanding and increased probability of variables that directly attribute to business results. This does not mean re-engineering the traditional way we have driven awareness or loyalty. It means tweaking our existing channels with augmented data to bring clarity and confidence to initiatives in which we have invested. The challenge with many of today’s marketing technologies is that data stitching isn’t available or sophisticated enough to do it well. With conventional data collection, consumers are identified using cookies, which are small pieces of data stored on their computers by the web browser they’re using. … it was clear that the conventional marketing wisdom must make way for an evolution. Data silos will need to be broken down and connected to one hub in order to create one cohesive ecosystem of data. Only then will it be possible to tap into all of the relevant data and move past time-consuming manual analysis. With a single ecosystem of data, powerful algorithms crafted by data scientists will pull all of your data together on their own, analyzing it on the fly to present companies with tailored recommendations for what is the next best action they should take. After all, the most important metrics for advertisers to consider is whether their programs — regardless of channel, platform, format, or metrics — actually had an impact on their businesses. Hessie is currently the Cofounder of Salsa AI, building AI for everyone through platform access, technology that simplifies AI so it is understandable to anyone, and empowers everyone. Hessie is a seasoned digital strategist​ and intelligence analyst​ having held management positions for start-ups, and ad agencies including Cerebri AI, Humans for AI, Yahoo!, Ogilvy, Rapp Collins, ONE and Isobar Digital​, as well as ArCompany. Hessie is the co-author of EVOLVE: Marketing (as we know it) is Doomed! She is also a​ speaker and active writer for Humans for AI, Huffington Post, Talent Culture, Steamfeed and ArCompany. Fantastic piece. One of the clearest explanations of the issues behind cross-channel for marketers and the need for actionable data.